Photo courtesy of Michael Booini. When not tinkering in the engine room or otherwise keeping his 60-foot motor yacht, the Miss Triss, shipshape, Burton Beitz, a retired commercial pilot, may be found on the bridge with his feet up and a cold drink in his hand. 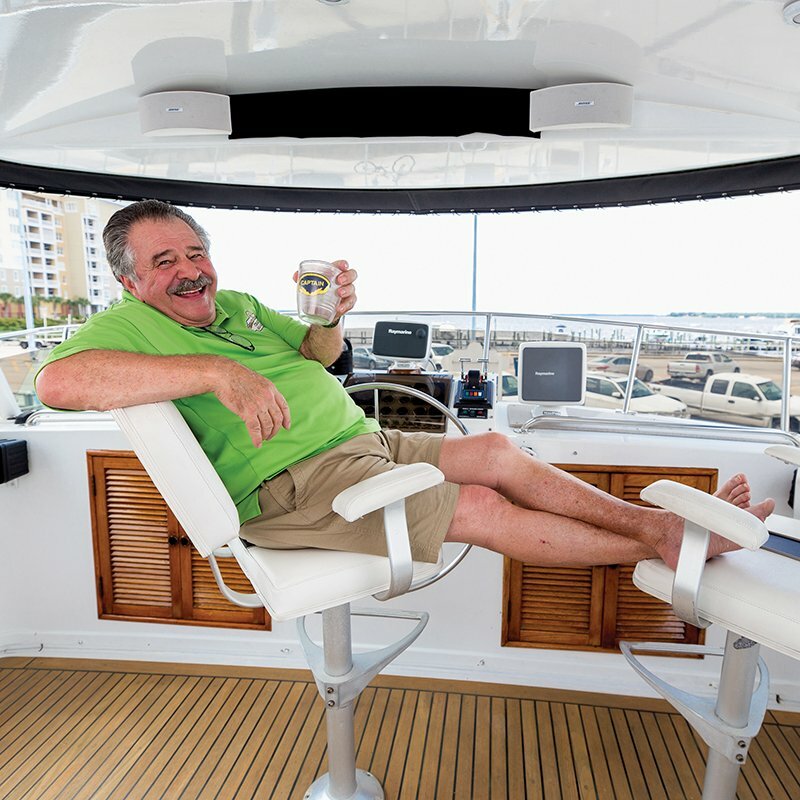 A retired pilot for Southwest Airlines, Burton Beitz is one of a handful of live-aboard residents at St. Andrews Marina. His home is a roomy, 60-foot Hartmann Palmer motor yacht called Miss Triss. He bought his boat in 2000 and has lived aboard it for 15 of the last 18 years. St. Andrews has a similar policy to the one at Panama City Marina, explained Sandy Wade, the marina manager: no new long-term leases, though those who had signed under an earlier rule may stay. “I used to do a lot of scuba diving. Whenever we went on a trip, it seemed like I was interested in what the boat was doing as much as what the divers were doing,” Beitz said, sitting in a large armchair in the salon. A cable TV music station played in the background. Now he stays put. But for most of his first year in retirement, he cruised among islands in the Caribbean, using a concierge service to help him book transient spaces in marinas. In 2012, Beitz was taking the boat from Houston, where he then was based, down to the Dominican Republic. He was halfway across the Gulf of Mexico when he learned his mother had suffered a stroke. “I came back to the U.S. and I was looking for a place where I could park the boat to come check on her. Southwest had just started servicing Panama City. I came here with the idea that I would be here a week or two, then I would move on,” he said. Instead, he became a resident at St. Andrews Marina. Each day, Beitz delivers fresh coffee to his mother, who lives in a nursing home in town. He is sometimes hired locally for test flights and ferry flights. His slip rental at St. Andrews includes water, cable television and Wi-Fi, with power metered on a monthly basis. He hires a pump-out boat to clean out Miss Triss on a weekly basis. The boat has a generator and a water-maker capable of producing up to 500 gallons of fresh water a day. He said he takes the boat out into the bay once a month. “Most of your live-aboards are like me — the boat is a floating condo,” Beitz said. He likens the marina, with its hundred or so vessels, to a village. For the past four years, Beitz has run a business, Emerald Coast Yacht Charters, and he and Miss Triss have been hired for dinner cruises, anniversary celebrations and weddings. He’s seen wedding proposals aboard his boat. As a notary, he was able to perform the wedding ceremony for his own daughter aboard. Miss Triss has four cabins, or bedrooms, and five heads — tiny, airplane-like bathrooms — as well as a spacious salon and galley where Beitz said he has served 20 people Christmas dinner. Miss Triss is one of the bigger boats at St. Andrews. “I don’t need this big of a boat myself,” he said, noting that Miss Triss became his full-time residence following his divorce. It offers plenty of room for his children and grandchildren to visit. For most of Bryan Miller’s adult life, he built parts for jet engines, working for General Aircraft Electric Engines, then Heico Aerospace. After a career in aerospace engineering, he started a web business that he described as “lucrative.” He sold it and opened another business, a woodworking shop. Miller used to live in Columbus, Georgia, where he owned a home, paid in full. Although he was only in his late 40s, he figured as of 2015 that he had enough money to retire, if he sold his house and business, cashed in his 401(k) and stayed within a budget. He began calling marinas in April of that year looking for a place to live. Miller was very clear when he made his calls: He wasn’t planning to buy a boat to keep at a marina. He wanted to live there. Miller said that as a child, he read books about the ocean and sailing and dreamed of going on his own nautical adventure. “I’d already gone through everything in my head. I’d been reading about people who live aboard,” he said. The store manager at the Panama City Marina told him that very few marinas allowed people to live aboard their boats. Even fewer allow it today. Panama City Marina allowed a limited number of long-term residents when Miller bought a 35-foot Columbia sailboat called Thyme and signed a lease. Now, it has a strict policy that does not permit long-term residence, according to Diana Pieper, who works in the marina store. The marina allows transient dockage for a maximum of six months in a calendar year, she said. Today, Miller lives with his wife, Sheila, aboard Thyme. He is one of two residents who were “grandfathered in” under the old rules, which changed when the marina signed its most recent land lease with the state Department of Environmental Protection. A couple docks over at St. Andrews sits Dauntless, a 38-foot Trojan powerboat that serves as the home of Rick Brush. Brush has lived on boats for seven years, first on a sailboat and now aboard Dauntless. He moved to Panama City from Kansas years ago to work as a pilot instructor, then worked for each of the city’s two marinas. To Brush, a live-aboard boat is comparable to a mobile home. He sleeps in a forward V-berth, a triangular cabin at the bow. Dauntless has one head, a small galley and a salon area for dining, which he uses as office space as well as a second elevated seating area. He moves away from his computer and printer to sit in the dining area, which is cooler on hot summer days. Many of Brush’s rhetorical examples of the homeowner who’d like to move aboard come from places like he did — Kansas, or in some examples, Arkansas. “Someone who has been living on a farm in Kansas their whole life, say they come down here to Panama City and buy a condo. They’re looking out on the water, the way they would do on vacation. Say they don’t want to stay in Panama City, but they want to go to Pensacola or Mobile, to Apalachicola, or down to Tampa or the Keys,” he said, tracing how such decisions are made. Photo courtesy of Michael Booini. Undaunted by a rising tide of North Florida marina regulations that do not favor live-aboards, Rick Brush is prepared always to sail away to more accommodating locales. Mobility, for him, is one of the chief advantages of a floating residence; he is pleased not to be in Kansas anymore. Like Beitz, Brush is able to live on his boat at St. Andrews Marina as a holdover from the older lease. But he said he is considering a move to South Florida, an area where living aboard is more common. “If I move away, if I release my slip here, I can never come back and live aboard here,” he said. Despite the rocking motion of waves, it can be easy to forget that the boat is indeed a mode of transportation. Like a car owner might pop the hood, Brush opens the panel in the floor of the elevated seating area to reveal the boat’s 900-horsepower engine. He said that Dauntless burns one or two gallons per mile and has a 350-gallon tank, which gives it a range of about 200 miles. “This is a fast boat,” he said. Photo courtesy of Michael Booini. Maybe they should call it Waterbnb. Boat owners including Seth Chandler of Jackson, Tennessee, and Panama City residents Kathryn and Chuck Miller have found success selling stays aboard their vessels via Airbnb. Their watercraft range from a motor yacht of 56 feet to a cozy 30-foot sailboat. Sometimes, the person living aboard a boat is not the boat’s owner, but a tourist that has booked a night or two via the online marketplace Airbnb. Unlike a charter, boats rented through Airbnb must be docked at a port and serve only as accommodation. Seth Chandler keeps three boats at St. Andrews Marina: a Hatteras 56-foot, wide-body motor yacht called Pentam; Meander, a 32-foot Lazy Jack schooner; and Emmanuel, a 47-foot Olympic Adventure sailboat. All are available for rent on Airbnb. Though he lives in Jackson, Tennessee, Chandler can frequently be found at the marina. A public relations executive by day, he owns about 30 rental and Airbnb properties across the country, including the three boats at St. Andrews. “When I first thought about trying Airbnb, I had no idea whether it was legal or if anyone else was doing it. I set up an LLC, bought a sales tax license, all of that stuff. I tried to do it properly,” he said. Chandler soon found that his Airbnb business took off. “Once in a while, someone will say, oh, ‘This is smaller than I thought,’ or ‘This smells like a boat.’ Well, yeah,” he said. One of Chandler’s boats is preparing for voyage. Before Chandler bought it, Emmanuel was a mission boat, traveling to foreign countries to distribute religious materials. He plans to donate three months’ time on the boat to ministers who need a break. This “minister at rest” program includes hiring captains paid with the boat’s Airbnb earnings. Kathryn Miller and her husband, Chuck, rent out their 30-foot Hunter Cherubini sailboat called the Audacious on Airbnb. Docked next to Beitz’s Miss Triss, the Audacious sleeps three in comfortable if relatively tight quarters. Miller, who is a real estate agent, said that she began renting out the boat last May. Along with a place to sleep, booking the Audacious includes a free sail on the boat, accompanied by Chuck, a retired merchant marine sailor. “You have to go on Airbnb and look at the reviews,” she said. Mike Miller, whose self-published book Living Aboard a Boat is available from Amazon, believes that many people hold misconceptions about living aboard. He said that he wrote his book and designed his website, Living-Aboard.com, for people who are considering the lifestyle. For one, living aboard is not significantly cheaper than living ashore, Miller pointed out. “People think that you get the boat, and that’s it,” he said. “Boats are constantly needing work. It’s a constant maintenance battle. It all costs money unless you’re going to do it yourself,” he said. Miller works as a writer in Mount Dora, Florida, and has lived aboard his boat on three occasions, most recently in 2004. “My goal is neither to discourage or encourage somebody to live aboard a boat. I enjoyed it very much, but not everyone will, I can tell you that,” he said. Miller eschews the notion of the typical live-aboard. Most people he knows that live aboard are working rather than retired, he said. He has seen families with children living aboard, as well as single women. A friend’s daughter was born aboard. Although living aboard is a beguiling option, that choice may soon be impossible to make legally. “The little mom-and-pop marinas that have allowed live-aboards have been purchased by conglomerates that don’t want to be bothered with them. There is more money in renting to people who don’t show up,” Miller said. “I think it’s going to be harder and harder. Municipalities all over the country are trying to get rid of live-aboards,” he said.